The World Trade Center North Tower was the tallest building in the world on its completion in 1971. But at a height of 1,368 ft. and with a big square floor plate, 209 feet on each side, the ratio of its base to height was less than 1:7. "Slenderness" is an engineering definition. Structural engineers generally consider skyscrapers with a minimum 1:10 or 1:12 ratio - the width of the building's base to its height - to be "slender." Slender towers require special measures to counteract the exaggerated forces of wind on the vertical cantilever. These can include additional structure to stiffen the building or various types of dampers to counteract sway. The image above compares at the same scale the former 1 WTC and the residential tower 432 Park Avenue, now under construction. The base of the apartment building is 93 feet square, and the shaft will rise to 1,398 feet, making its slenderness ratio 1:15. 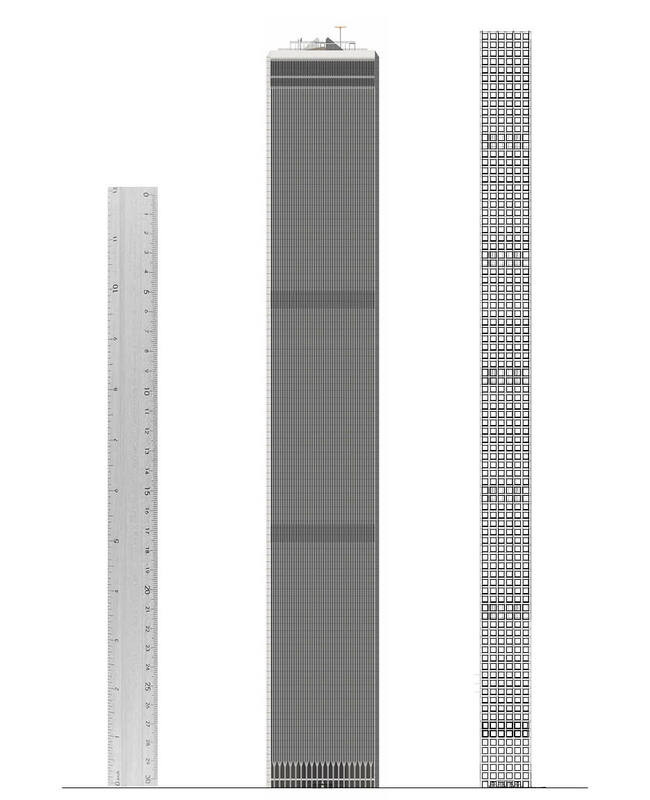 To visualize a 1:12 ratio, we show a ruler 1-inch wide and set on end.